Butlins Minehead Caravan Hire - Welcome. Welcome to Butlins Minehead Caravan Hire. Our aim is to provide quality self-catering accommodation at affordable prices. Our Privately owned caravan at Butlins Minehead offers families and adults a variety of holidays and weekend breaks packed full of excitement and entertainment all year round! The resorts Skyline Pavilion plays host to many all weather attractions, from places to eat, drink, play and be entertained regardless of the weather outside. To view some of the great facilities available at Butlins Minehead, click here. *Don't forget, when you book your Butlins Minehead Holiday with us, your entertainment passes are included in the price, making it excellent value for money! Click here for availability, prices and booking. The caravan and fishing lake. 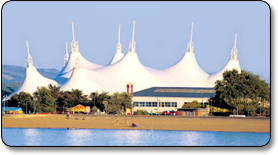 Our caravan is sited on the Lakeside Caravan Park which is located within the Butlins Minehead Complex itself. It is an 8 berth 'Willerby Seasons' 2017 model and is equipped to the highest standard. Quiet and privately located and only a stones throw from a peaceful and tranquil well stocked fishing lake and all major attractions.